Biscuit, Meet Gravy | Travel Musings • Yummy Insights • Join me on my tasty journey! Not quite sure where my love of biscuits and gravy blossomed. I never had ’em as a kid. Found the gravy rather gelatinous and gaggy as a 20-something, but now find they move me like magnetic north moves a compass needle. I’d never consider myself a connoiseur of anything, but I guess I come close to it when visiting the world of biscuits and gravy. I found myself on the road just a morning ago – dropping the boy off at the crack o’ dawn for an early-morning roll-out with the UW Huskies. Hating traffic as I do, I drove the usually up-around-and-down circuitous route into the campus, which just happened to take me past Voula’s Offshore Cafe. After dropping the boy, it occurred to me that I’d be nearly 2 hours early to work if I just jetted around Lake Union and back into downtown, so instead, I pondered my options: Find a spectacular spot to watch the sunrise (immediately shot down due to cloud cover and impending rain) or … go back to Voula’s – where I’d only been once before, but where I felt my magnetic north was pulling me. Backing into a spot in front of the restaurant that really seemed to be calling out my name, I knew by looking into the brightly-lit diner that this was, indeed, the right choice. Crusty marine techs and grease-under-the-nails dudes sat at nearly every table. Not an eye batted as I made my way over to a counter-roost at the far corner of the line. ‘Mellow’ would be an understatement, ‘tho there was a friendly ‘G’morning’ from the head hashbrown-flipper as I passed by. I immediately spotted ‘Billy Biscuits’ on the menu and knew I’d found my calling. The only problem? There was no way I was telling the waitress I wanted ‘Billy Biscuits’. Who makes up a name like that for biscuits and gravy, anyway? Order placed (with a note that I wanted my hashbrowns extra crispy, of course), I enjoyed my piping-hot coffee and morning Seattle P-I. I’ve got to say, listening to two slightly rough-hewn characters sitting at the counter next to me talking about one’s new love interest was nearly more than I could bear. Their girl-talk about how SHE didn’t have a job (i.e., she’s an artist), and he didn’t know if he could keep up with her spontaneous schedule was hilarious. Hearing him say that he’d been up half the night wondering why she hadn’t called was over-the-top. They were sounding more sorority girl and less marine mechanic by the second! Fortunately, my order came quickly. The hashbrowns were cooked to perfection – the crispiest I’ve had in the city, without a big of sogginess. Golden brown turned to the dark side … just to my liking. Already, Voula’s was bringing me their A-game. 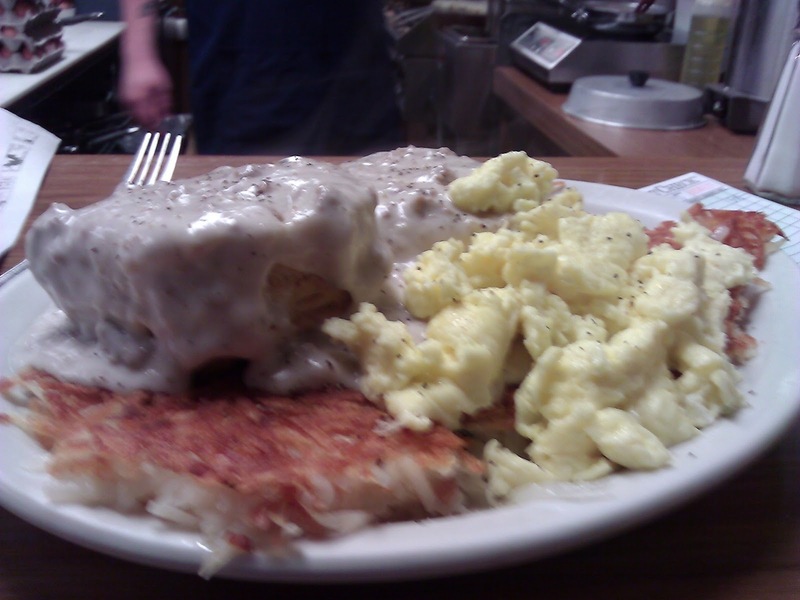 The real test would be the star of the plate: my biscuits and gravy, of course. Voula’s biscuits were a close second to the best I’ve had, and the gravy couldn’t have been hotter. I’d watched the line chef check the temp and heat it up on the induction plate (as if he could read my mind) – which pleased me to no end. I’m shocked how many restaurants serve these with tepid gravy. Nothing worse than a beige heap of luke-warm gravy first thing in the morning. I dove in fork-first: biscuits with gravy … gravy with hashbrowns … hashbrowns with gravy and biscuit … egg with biscuit … egg with gravy … I felt like a pig in a poke! After what seemed like an hour of shoveling in this mound of salty, sausage-y deliciousness into my face, I sat back sated – sadly having nearly half left on my plate. Doggie bags for breakfast just aren’t my thing. I knew I’d never have the same experience with an hour’s-old (or next day) re-heat, so I waddled away from the residual of my breakfast, paid the bill (barely over $10!) and plunked myself back in the car. Voula’s – I’ll be back.